But I'm a CUTE Drooly Monster! If you've been reading my recent posts, you'll already know that Laura has started a recipe blog so she won't forget her favourite cooking experiments and will always have her recipes available to her, no matter where she is living. Well, she hasn't posted MY favourite recipe yet, so I thought I would post it here, just to be safe. I like kibble, and I like my Zukes treats. I like sharing apples with my friend Laura and I like to clean her hands after she cuts up mangoes. I like helping my Mum to clean out yogourt pots too. But everyone knows that the best food is food made with love, and my most favourite food of all is a special peanut butter cookie that Laura makes for me. * Make sure you use real peanut butter -- NOT peanut flavoured icing. The only ingredient in peanut butter should be peanuts! All of that extra sugar in the sweetened spreads isn't good for dogs -- and it isn't good for you either! ** Tonight we listened to music by Susie Keynes while Laura was baking. Laura listens to FRUiT music a lot when she is cooking, and also the Wyrd Sisters. I know that you have to listen to Wyrd Sister music when you're making cheesecake, and I think FRUiT music is good for making pies. If you were making pizza and beer, you should probably listen to Allison Brown. Other than that, I think you can pretty much listen to whatever music you like. 2. Mix the peanut butter and milk together until well blended. 3. 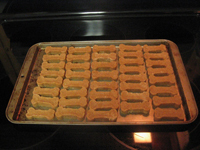 Pour the flour and baking powder over the peanut butter mixture. Mix flour and baking powder together before incorporating flour mixture into peanut butter mixture. 4. Knead dough well. The warmth from your hands helps to make the dough stick together and also a lot of love can go into the cookies through your hands. 6. 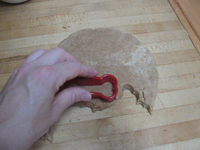 Press cookie cutter into dough to cut it. 8. 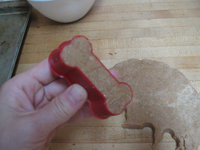 Clean off any dough that is stuck around the edges of the cookie cutter, so you will have a nice, perfect, dog-bone shaped cookie. 9. 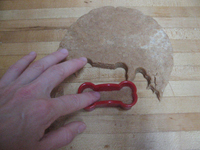 Carefully press the cookie out of the cookie cutter. 10. Again, very carefully, transfer the cookie onto a baking sheet. Be careful not to break it! 11. See all those extra bits of dough that got cut off the outside of the cookie cutter? Don't throw them out! 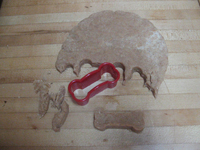 This dough is so easy to work with that, once you have cut up the main sheet, you can pick up those little extra bits and press them into the cookie cutter, using your fingers to mould them into the cookie cutter shape. The last little crumbs of dough might be kind of crumbly -- just use lots of extra love to make them stick together! 12. Bake cookies for 15-20 minutes at 400°F. 13. While the cookies are baking, clean everything that touched the dough -- including the counter on which you rolled out the dough -- really well, so that your allergic friends don't get sick when they come to your next dinner party. 14. 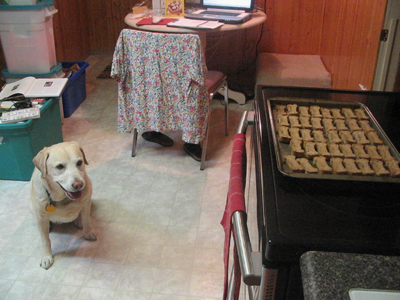 When the cookies first come out of the oven, they will smell VERY GOOD -- but you have to wait to eat them! When they first come out of the oven they are HOT and could burn your tongue. Be patient! 15. Once the cookies have cooled, you can enjoy them -- but not too many at once! I only eat one per day. Laura puts them into ziplock bags, seven to a bag, and freezes them. We thaw out one bag per week and I enjoy the cookies in that bag while the rest stay frozen. This helps the cookies to stay fresher so they are always yummy. These cookies are so good! I hope that every dog will have a friend as good as Laura who will make them for her/him. Posted by Princess Kendal, Wonder Dog at 1:42 a.m.